Intract has developed unique models as a rapid and cost-effective means to evaluate drugs in the GI compartments of both animals and humans. Our strategic clinical collaborations provide unique access to biological fluids and tissue samples from healthy subjects, as well as patients with GI diseases. The models have been used to evaluate numerous small molecules and biologics with distinct physicochemical and biopharmaceutical properties. Our comprehensive knowledge and capabilities can support both preclinical animal studies and advanced product development for greater clinical success. Our GI models can determine if limited solubility or intestinal degradation will impact drug bioavailability and efficacy. We have unique access to human gastric fluids (HGF) and small intestinal fluids (HIF) from healthy and diseased subjects providing unparalleled in vivo predictions. For over a decade, our CSM has provided unique insights into the colonic behavior of both drug compounds and product formulations. 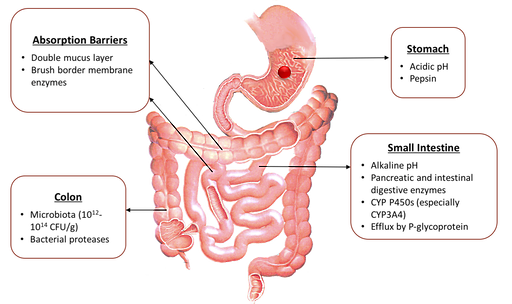 Using bio-relevant inoculum, proprietary media, and a specialist anaerobic work-station, our model accurately mimics the conditions of the large intestine.